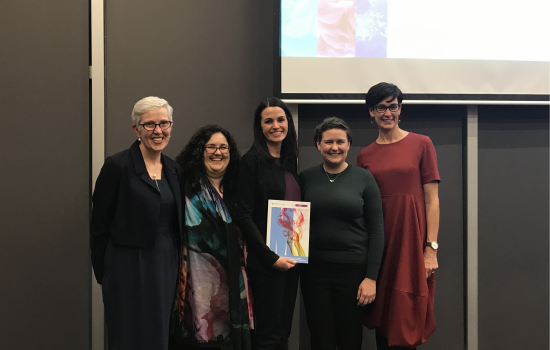 The Research Report was launched by Liana Buchanan, the Victorian Commissioner for Children and Young people and a part-time Commissioner of the Victorian Law Reform Commission. Liana commenced as Principal Commissioner for Children and Young People in April 2016 and is responsible for overseeing services for children and young people in Victoria and promoting their rights, interests and wellbeing. Liana has held a range of roles focused on oversight and system reform for people experiencing disadvantage and those affected by family and sexual violence. These roles include Director, Office of Correctional Services Review, Executive Officer of the Federation of Community Legal Centres and roles in the Equal Opportunity Commission, Department of Justice and Women’s Legal Service (S.A). Professor Sharon Pickering (Dean, Faculty of Arts, Monash University) MC'd the event, which was followed by a panel event with questions and discussion with Liana and Professor JaneMaree Maher, Dr Kate Fitz-Gibbon and Helen Fatouros. The Report is now publicly accessible online here. It presents the findings of a qualitative study examining adolescent family violence in Victoria. The study involved two phases – a survey with 120 persons experiencing adolescent family violence as well as focus groups and in-depth interviews with 45 experts, service providers, general practitioners and health service providers. Our findings explore gender, age and types of adolescent family violence; impacts and experiences of adolescent family violence, social structures and responses, the role of the criminal justice system and recommended future work in this area. While primarily Victorian focused, the findings are of relevance to all Australian jurisdictions and comparative countries. Further background on this project can be found on the project webpage, including our previously published Context Report Investigating Adolescent Family Violence in Victoria: Background, research and directions. Further information on the International Network Addressing Filial Violence is also now available on the Network's webpage.